Sometimes I feel like a broken record posting on quick and easy dinners, but folks, let me tell you that pretty much all the cooking happening at my house right now falls into that category. The one exception would be the chocolate chips cookies I made in a motherly moment for my toddler last week. I realized I had never baked chocolate chip cookies for her, meaning I hadn't made chocolate chip cookies in nearly two years, and decided she would love it and it would be the most wonderful bonding moment ever to happen over warm cookies, gooey chocolate and a nice tall glass (sippy cup) of milk. Except that it turns out that my toddler doesn't love chocolate chip cookies. Not even a little bit. Chocolate chips? Yes. Cookies? Sure. Chocolate chip cookies? Mom. Please stop trying to feed me those things. It was very disappointing to my visions as mother-of-the-year, but at least there were plenty of cookies around to help me eat away my sorrow. This dinner, however, was devoured without a second glance by the same, cookie-rejecting toddler. And me. It is such a simple recipe, but there is something about its bright, lemony flavor that makes it taste special. 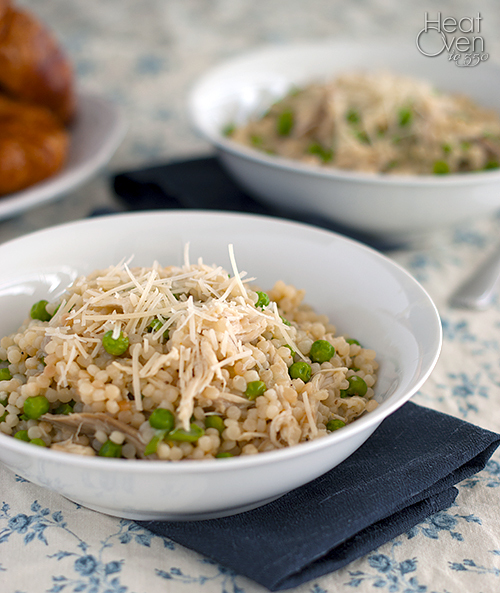 The pearl couscous is a fun change from regular pasta and toasting it beforehand gives it a nice flavor. Peas are always a favorite at our house, and so is Parmesan cheese, so I made this knowing I had stacked the odds in favor of a successful dinner. And, I promise, this dish comes together in no time, making it not only delicious but convenient as well. You could finish it up and whip up a batch of cookies and still have time to watch your toddler reject them before you go to bed. Stir in the chicken broth, 3 tablespoons lemon juice, salt and pepper and bring to a boil. Reduce the heat to low and simmer uncovered until the couscous is tender, about 8 minutes. 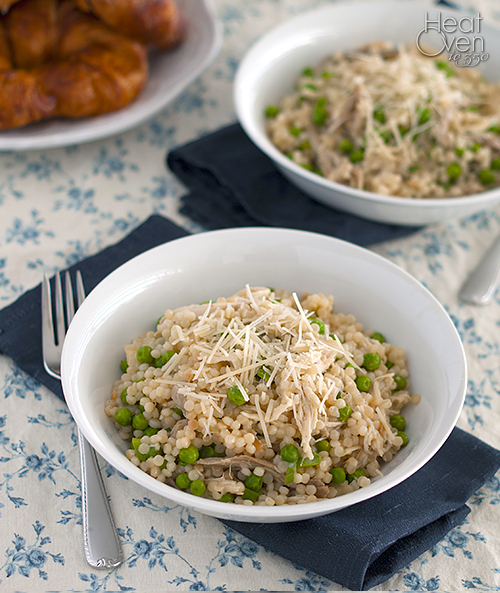 Stir in Parmesan, green onions, peas and chicken. Cook and stir 1-2 minutes or until heated through. Season to taste with more lemon juice if needed. Serve. This is one meal that I'd be so happy to sit down to -- simple but oh so delicious! I've just recently discovered pearl couscous and I could eat it every day!